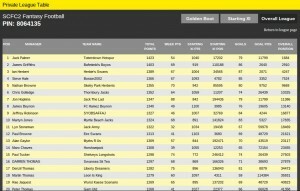 The SCFC2 Fantasy League uses the Daily Telegraph’s Fantasy Football site to run the private league. The concept is quite simple – you have a virtual £50 million budget to spend on your team of 11 players. Those players earn you points when they play in the Premier League game, the more points you get the higher up the Fantasy League table you climb! Players will need to go to http://fantasyfootball.telegraph.co.uk/ to register for the game. When you register your team, search for the SCFC2 league below and enter the pin! Your then entered and in with a chance of winning! Please note YOU MUST have registered and joined the private league BEFORE the last week in September to be eligible to play. Only 1 team per person is allowed. 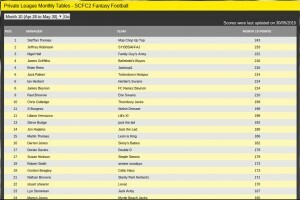 The monthly SCFC2 Fantasy Football winner will win an SCFC2.co.uk polo shirt with the overall winner at the end of the season getting their hands on £75 of Swansea City Football Club Superstore vouchers. If you are lucky enough to win more than 1 month then other prizes will be on offer! Here is the latest news for the SCFC2 Fantasy League for the 2014-2015 season. 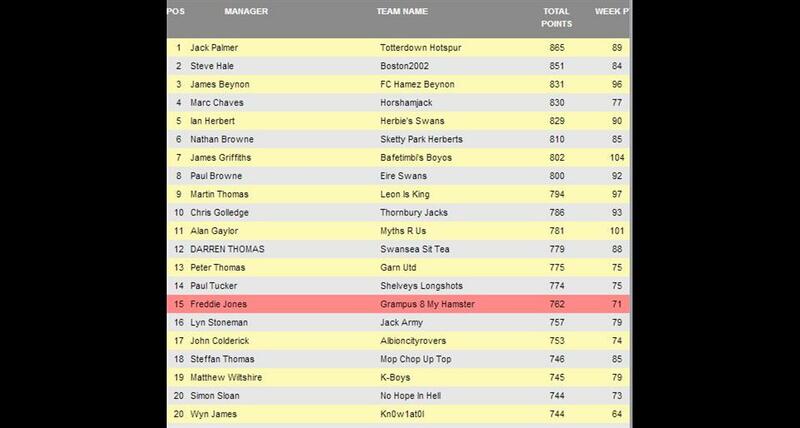 Steffan Thomas is the Month 10 winner of the SCFC2 Fantasy Football competition. His team, Mop Chop Up Top, lead the scoring with 243 points, beating Jeffrey Robinson’s SYOBSAFFAJ (233 points) into second place. 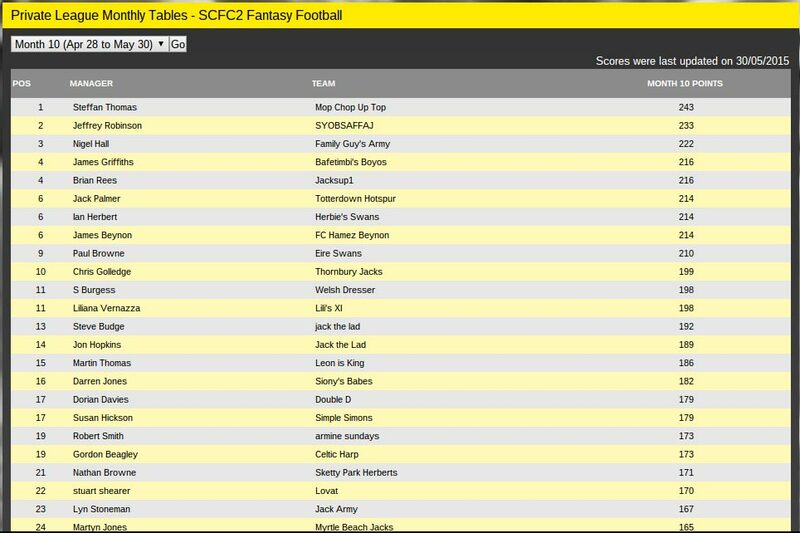 Family Guys’s Army managed by Nigel Hall (222 points) rounds off the Top 3. Click on the images to see a full-screen version of the tables. Manager of the Month for Month 9 goes to Stephen Richardson and his team Essexswan with a pretty decent 201 points – congratulations Stephen! The nearest team to challenge Essexswan were King is Leon Britton with 183 points whom are managed by James Griffiths. 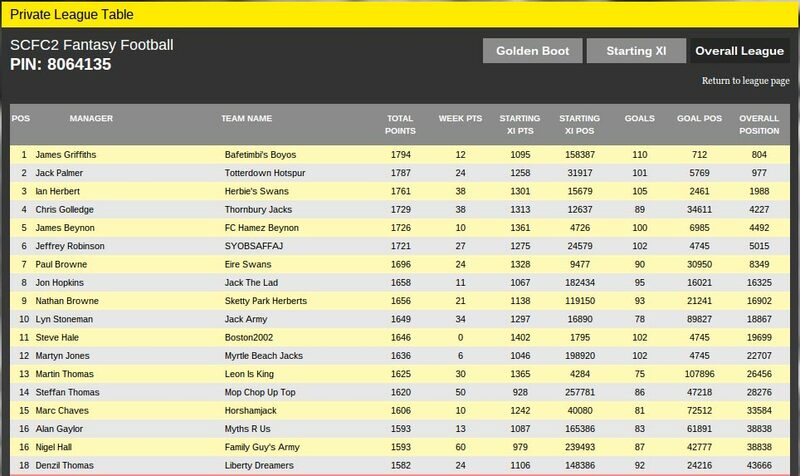 We have a new overall leader in the shape of Bafetembi’s Boyos managed by James Griffiths whom have amassed 1630 points to date, some 24 points ahead of the nearest challenger – and former league leader – Jack Palmer and his team Totterdown Hotspur on 1604 points. 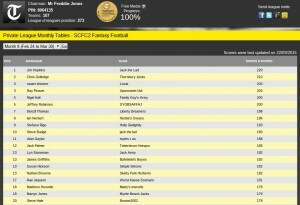 Jon Hopkins is the Month 8 winner of the SCFC2 Fantasy Football competition. 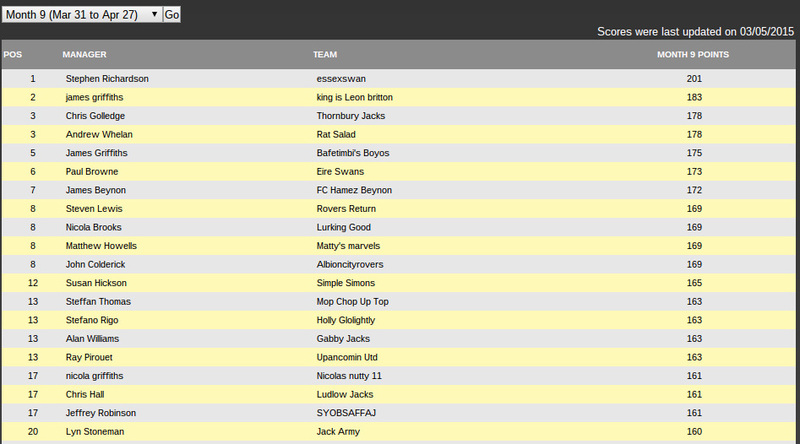 His team, Jack The Lad, topped the scoring with 220 points, beating Chris Golledge’s Thornbury Jacks (210 points). Lovat managed by Stuart Shearer and Pirouet’s Upancoming Utd finished equal third on 203 points. 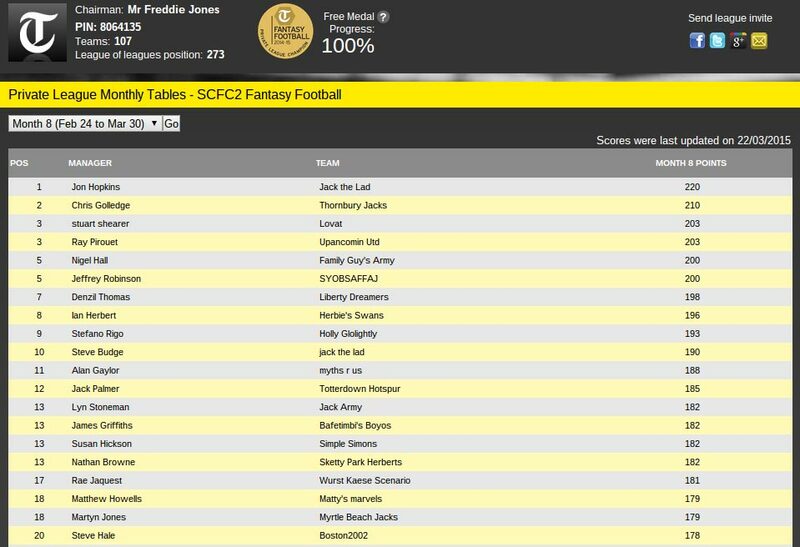 James Griffiths is the Month 6 winner of the SCFC2 Fantasy Football competition. His team, King Is Leon Britton, topped the scoring with 227 points, beating Steve Lloyd’s Maidenhead Jacks (221 points) and Nicolas Nutty 11 (220 points) manage by Nicola Griffiths. 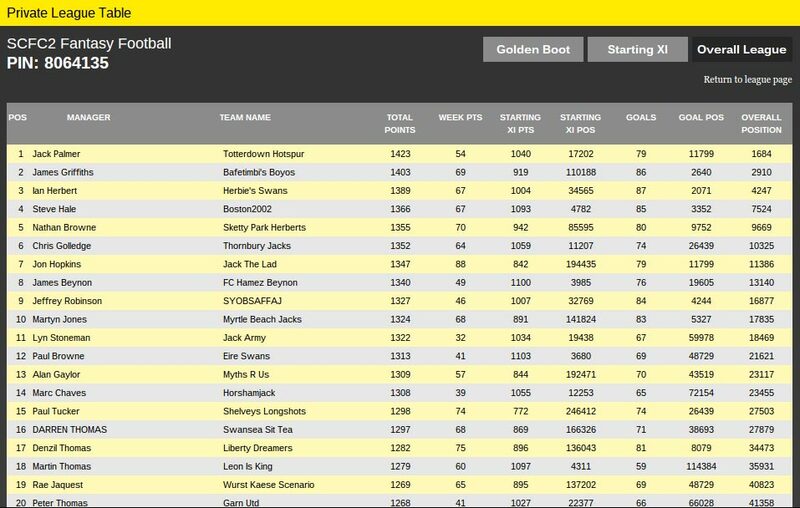 James Beynon is the Month 5 winner of the SCFC2 Fantasy Football competition. 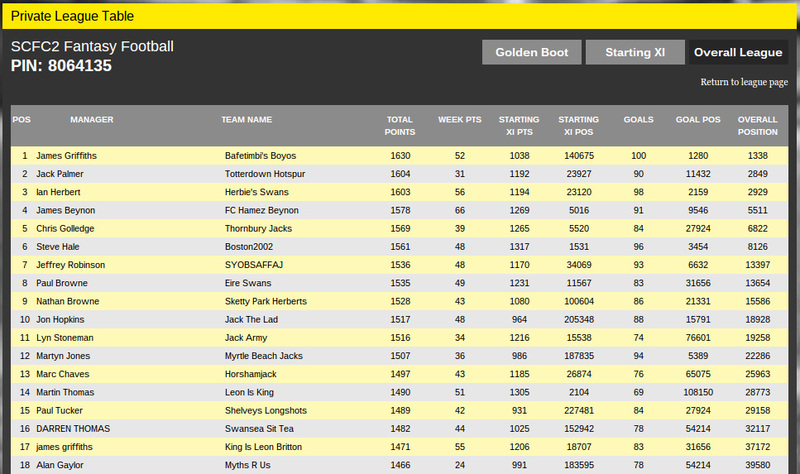 His team, Myths R Us, topped a high scoring month with 312 points, beating Alan Williams’ Gabby Jacks (303 points). Marc Chaves rounds off the Top 3 with Horsham Jack (298 points). 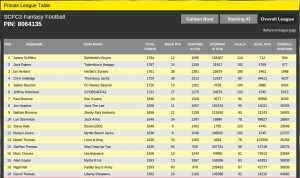 Matthew Howells is the third monthly winner of the SCFC2 Fantasy Football competition. His team, Matty’s Marvels, tops the monthly scoring with 166 points, beating Jack Palmer’s Totterdown Hotspur (165 points) by just one point. This is the second month in a row that Jack has finished runner up! Albioncityrovers, managed by John Colderick, rounds off the Top 3 on 162 points In a closely contested period of scoring. 2012/13 champion Ian Herbert now leads the overall scoring with Herbie’s Swans (438 points), 7 clear of Jack’s Totterdown Hotspur’s. Steve Hale’s Boston2002 complete the Top 3 with 430 points. Steve Hale is the second monthly winner of the SCFC2 Fantasy Football competition. His team, Boston2002, tops the monthly scoring with 147 points, beating Totterdown Hotspur (140 points) managed by Jack Palmer. 2012/13 champion Ian Herbert rounds off the Top 3 with Herbie’s Swans (137 points). Steve also leads the way in the early stages of the overall points scoring on 292 points, 3 clear of Ian. Last seasons champion, Chris Golledge, completes the Top 3 with Thornbury Jacks on 274 points. If you have any questions or queries about the SCFC Fantasy League please contact us.